While mirrorless cameras are all the rage right now, Canon hasn’t forgot about its DSLR bread and butter. It just launched the 24.1-megapixel APS-C sensor EOS Rebel SL3, the smallest and lightest model in its EOS lineup at just 15.84 ounces, or 449 grams. Spec-wise, it’s much like Canon’s mirrorless EOS M50. It packs the same DIGIC 8 processor, 3.0 inch flip-around touchscreen for vlogging and selfies and 4K video (with some big limitations). Most importantly, it’s Canon’s first EOS model to have Dual Pixel autofocus with eye detection in live view shooting mode. Pro shooters often prefer DSLRs that use separate phase-detect autofocus (AF) systems to acquire subjects more quickly than mirrorless cameras. With the Rebel SL3, Canon is having its cake and eating it too, offering an optical system with 9 AF points and spot focus for precise subject selection. At the same time, it packs Canon’s vaunted Dual Pixel system — embedded directly on the sensor — that offers quick and accurate AF for 1080p video and live view (non-optical) shooting. While probably not quite as quick as the optical system, the eye-tracking AF is a big plus on a budget DSLR. 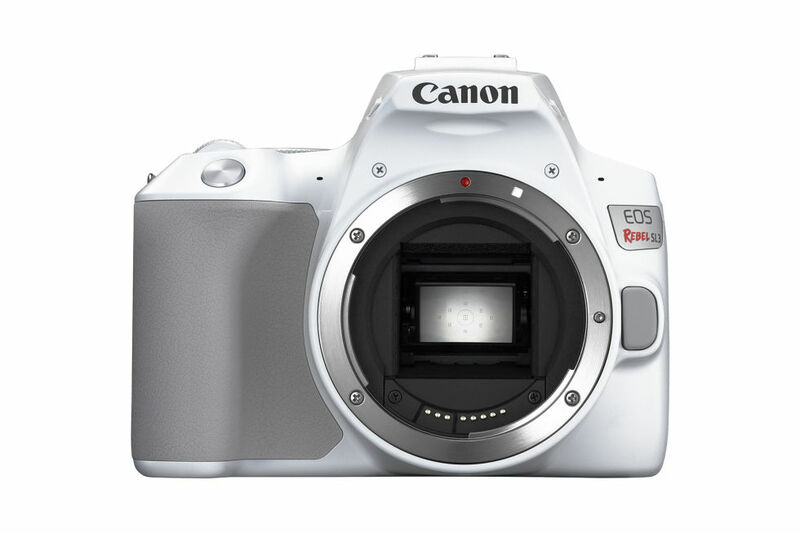 The SL3 is also Canon’s first Rebel camera with 4K. Unfortunately, however, it doesn’t work with Dual Pixel, significantly crippling its autofocus capabilities (you’re limited to contrast-detect AF instead). On top of that, the sensor is cropped by 1.6 times, like it is on the EOS M50, giving you an effective sensor size that’s smaller than Micro Four Thirds. It also lacks sensor-based in-body stabilization, using digital IS instead that also introduces cropping. As for other specs, you can shoot at 5 fps, the ISO ranges up to 25,600 (51,200 expanded) and the battery delivers a whopping 1,600 shots, or 350 with live view, much like the last Rebel SL2 model. Other new features include an automatic “smooth skin” mode that should go well with the flip-around selfie screen and a feature assistant guide that lets you blur the background — like a smartphone — even without a fast lens. The Canon EOS Rebel SL3 arrives at the end of April for $600, or $750 with an EF-S 18-55 mm f/4-5.6 IS lens. At that price, its closest rival is probably Nikon’s $500 D3500 DSLR, and despite the 4K limitations, the SL3 looks like a much better camera for just $100 more.